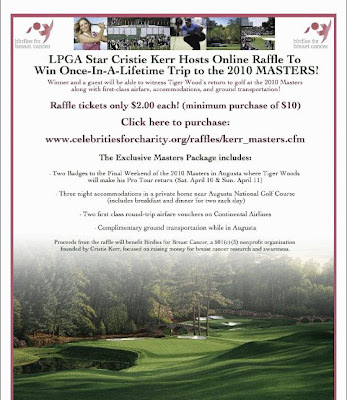 Ok tell me this doesn`t sound good winning a trip to the see the Masters live on the Saturday and Sunday of the Masters and the money from the online raffle goes to Cristie Kerr`s charity 'Birdies for Breast Cancer'. Tickets are only $2 and a minimum of 5 tickets must be purchased. Gets your now I know I will right around my birthday. A nice present! Very good cause! after having a family member die from this.